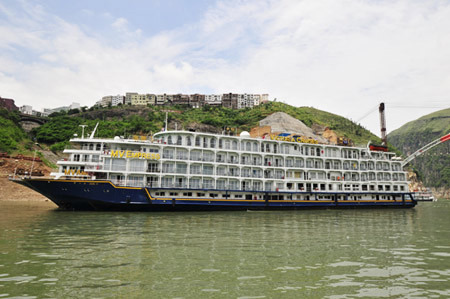 Victoria Grace (Empress) is carefully designed to ensure the maximum comfort for the passengers when they are enjoying the charming scenery, history and culture of the Yangtze River and the Three Gorges. Intimate balconies in every stateroom afford outstanding views and unforgettable memories. The Victoria Grace (Empress) offers handsomely decorated accommodations, imported marble bathrooms, and enhanced stylish interiors exuding European refinement. Deep blue carpets and richly polished wood banisters grace the interior of the ship. The attentive and helpful staff enables travelers to make the most of their time to relax and enjoy the enchanting river scenes of the Yangtze. Day 2 Traditional Chinese Tai Chi. Shore excursion to Shibaozhai. Optional tour to Fengdu Ghost City (RMB 295/person). Captain's Welcome Dinner. Victoria Costume Show. Day 3 Traditional Chinese Tai Chi. Sailing through Qutang Gorge. Shore excursion to Goddess Stream. Sailing through Xiling Gorge. Farewell Buffet. Optional tour to White Emperor City (RMB 295/person). Day 4 Buffet breakfast onboard. Disembarking at Maoping pier of Yichang. Shore excursion to the Three Gorges Dam Site. Take a bus to Yichang and farewell to Yangtze. Day 2 Traditional Chinese Tai Chi. 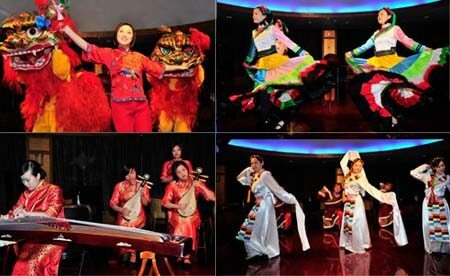 Optional tour to the Three Gorges Tribal Scenic Spot (RMB 260/person). Shore excursion to the Three Gorges Dam Site. Sailing through Xiling Gorge. Victoria Costume Show. Day 3 Traditional Chinese Tai Chi. Sailing through Wu Gorge. Shore excursion to the Shennong Stream. Sailing through Qutang Gorge. Day 4 Optional tour to Fengdu Ghost City (RMB 295/person). Farewell buffet. Fairwell party. Shore excursion to Shibaozhai. Day 5 Arriving in Chongqing at 9：00. 香港酒店 | 广州酒店 | 广州会议酒店 | Indochina Tour | Guide for China tours, offers most value & amazing experience. Chinatourguide.com. Your reliable China tour agency.